Stephanie Brooks - May Contain Nuts, Mirth of a Nation #3: The Best Contemporary Humor, edited by Michael J. Rosen. 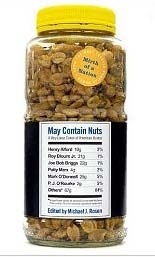 May Contain Nuts, Mirth of a Nation #3: The Best Contemporary Humor, edited by Michael J. Rosen. Plus, there's Roy Blount Jr. on how to travel "Southern" outside the South; summer recipes from our man in the kitchen, Henry Alford; Firesign Theatre's Phil Austin's yuletide "Tale of the Old Detective"; P. J. O'Rourke's not-so-intimate "Diary of a Country Gentleman"; Daniel Radosh's "PowerPoint Anthology of Literature"; and Tom Gliatto's helpful overview of today's thriving cabaret scene. With umpteen illustrations, many perplexing charts, and our first centerfold ever, this volume is party-sized for your reading pleasure.